wow! so nicely done! please share some of your colors and techniques! I was using mostly Citadel paints. Base coated the models in black. 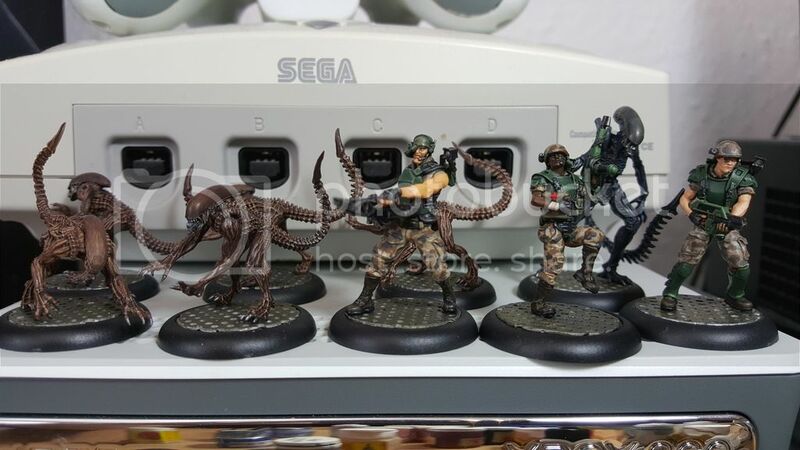 For the marine´s clothes using Kommando Khaki. Beastial brown and Ghoul grey for the camuflage patterns and wash with brown grey mix again. The armor is painted black and I was using salamander green for the color. Highlights are mixed the green with Kommando Khaki and goblin green a bit in differnt brghtness layers. I was a bit lazy to do the camuflage pattern on the armor because I thought the models might look a bit too "untidy." So I left it just green. The Stalkers are painted in beastial brown, highlighted with several layers of getting brighter paints; First layer was hobgoblin orange, then some occer tone and last bleached bone. Afterwards they got washes again with black, brown mix to tone them down again. And the infants I just painted black, hightlight layer 1 with moody blue, second layer with moody blue/Kommando Khaki mix. And a 3.rd layer with same mix just brighter for the especially "high spots." Then washed again with black. In the end they got varnished to look more shiny again. Those look amazing! 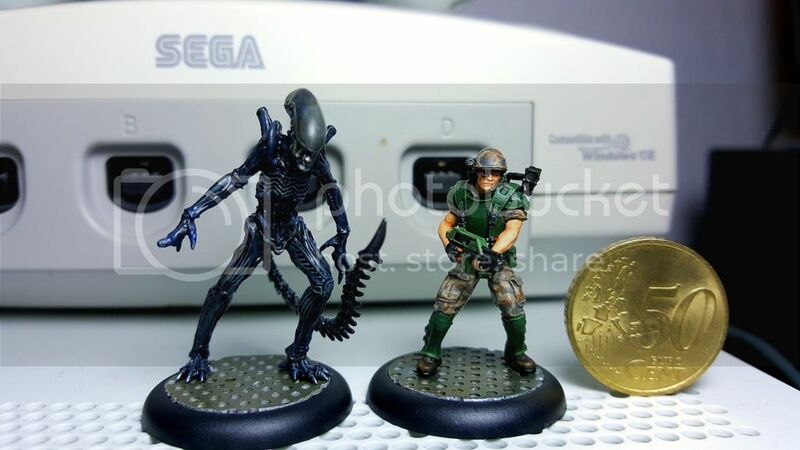 I like how the aliens are still a dark color and aren't too blue or anything. Also I agree, the old GW paints are immortal. Question: what did you use for the marine's skin? Very well blended. Please post more close ups of your marines! I really really like your scheme. The contrast between the dark green armor and the camo is fantastic. I need more pictures so I can shamelessly steal this idea for my own. They say imitation is the greatest form of flattery.